I had the pleasure of going to Cleveland’s Lava Room Recording studio on Thursday to cut drum tracks for several tunes for our upcoming album. Lava Room is located in the Agora building, a storied concert venue since 1986 (although the building itself dates back to 1913). I saw many shows there in the mid- to late-1990s including a mind-blowing early Wilco show among others. Lava Room had been recommended by several of my fellow musicians including Jeff Endemann who cut his solo album there not long ago. Last year around this time I did a similar drum session for some material of my own. I was very happy with the results, and I opted to do another drums session for these DD69 songs. I was fortunate to get Chris Ebbert to engineer the session and Steve Renko to perform the drumming. Both of those guys are professional while at the same time personable and easy to work with. My kind of people. We started at about 10AM, with Steve getting drums set up while Chris and his assistants Dave and Chad set up the microphones and patched everything into the control room. 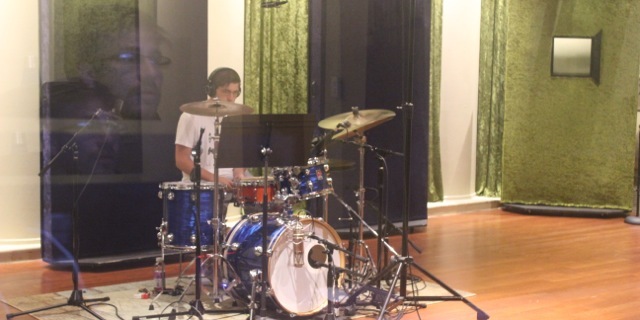 Chris had dialed in some amazing drum sounds in short order, and we dove right into the recording process. It went smoothly thanks to Steve’s preparation and Chris’s facility with Pro Tools and all the associated gear. I had dropped the current sessions to stems, which are essentially submixes of separate parts (like drums, bass, rhythm instruments, vocals, etc), and that made it pretty easy to set up the sessions for drum tracking. Since most of these songs have been assembled from Studio Night jams, along with new choruses and other parts that I added later, it was much easier to use stems than to bring up the Frankenstein-like sessions themselves. Steve did a few takes of each song, trying out some different ideas, and nailed most of them down quickly. a month or so ago I had provided him with demos of the songs to which he would be tracking, and he had charted them out beforehand and knew what he was going to do. The exception was the most recently completed song called “Fall Back In It”. I had finished the song the weekend before the session, so it was a last-minute addition. And there was an unusual 16th note rest before the last chorus, after which I wanted the rhythm to pick up almost as if nothing had happened. We went back and forth with that concept for a while until Steve got the idea and we got the take we wanted. Aside from hashing that out, I couldn’t have asked for a session to go better. I’m excited to finalize this batch of tunes, which has been in development for the last couple years – since our last album Get Up in 2012. Stay tuned: The Pint of No Return will be released online soon!